Corsair Air Series Twin Pack LED high static pressure PC case fans combine efficient high pressure airflow with striking LED lighting. The SP140 fan pushes up to 49.49CFM at 1440RPM while producing up to 29.3dBA. 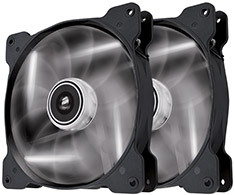 They’re custom designed to deliver air directly to high temperature components with less noise and turbulence than ordinary fans. The custom molded blades are translucent and have a frosted texture, so the light from the four LEDs adds a dramatic effect. Backed by a 2 year Corsair warranty.